Pulmonary Hypertension is high blood pressure in the vessels that carry blood from the heart to the lungs (the pulmonary artery and its branches). By definition, Pulmonary Hypertension is diagnosed when the blood pressure in the heart to lung circulation exceeds 25 mm Hg at rest or 30 mm Hg with exercise. The World Health Organization (WHO) has developed a clinical Pulmonary Hypertension classification scheme into 5 groups based on etiology. Group 1 (Pulmonary arterial hypertension, PAH) which includes idiopathic, heritable and associated PAH. This latter group is important as it includes congenital heart disease as an etiology. 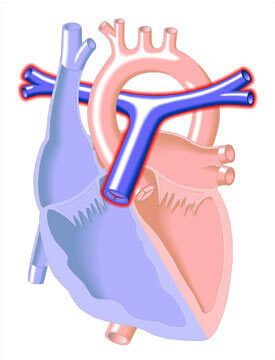 Persistent pulmonary hypertension of the newborn is a separate but common Group 1 etiology. Group 2 is Pulmonary Hypertension due to left heart disease and Group 3 due to lung disease or hypoxemia. This is an important category as premature infants that develop chronic lung disease are at high risk for the development of Pulmonary Hypertension. Group 4 Chronic thromboembolic pulmonary hypertension and Group 5 Pulmonary Hypertension with unclear multifactorial mechanisms are rare in children. Group 1 idiopathic and heritable PAH are rare, but affect females more frequently than males (2.4 to 1). Pulmonary hypertension results in a progressive increase in pulmonary artery pressure.